Australia’s Vitaman is my first product to be reviewed. I spoke in my last post about knowing a little bit about hair products. Out of all my products gathered, it is what I’ve used the longest, comparing that to things like moisturisers, toners, serums, etc. I’m excited to share my review and I want to make sure I give my honest opinion to my readers. I wanna make sure I promote products that I genuinely would use myself daily or weekly. So lets see what I made of the Vitaman hair product I received. So let’s get together some background information about this brand. Because it was a first time encounter for myself and it is always good to know too, where you product is coming from. An established Australian brand that was founded just over 15 years ago, by the multi talented Clare Matthews. A former salon owner, now an experienced beauty therapist and international skincare lecturer, saw a market for men’s grooming and beauty products and the lack of them, available for men. After extensive research the brand ‘Vitaman’ was founded. Since then it’s established itself as one of the highest quality, mens beauty and skincare providers, to all across australia and also to places across the globe. Recognised by many, Vitaman is Australia’s leading specialists with their 15 years experience. Vitaman is 100% made in Sydney, Australia. The brand is proud of its heritage and only uses all natural and premium items in their products. The quality rivals that of a spa, using native botanicals which are sourced only to the highest standard and purity. I’m guessing if it doesn’t make the cut, it doesn’t get used. Animal testing is a huge no, no for Vitaman. Keeping it to a respectable level. No nasty and harmful chemicals are used or added to prolong the product. That means, artificial fragrances, sulphates, mineral oils, DEA, TEA (and ABC’s). It is a company that values the well-being of those inhabiting the planet, as well as the planet itself. Recycling is a big factor too, as the packaging is fully recyclable. So even before using the product I had received, it is a brand that I feel happy with as a whole and as a consumer. The concept of Vitaman is very chilled but professional too. It gives me surfer attitude and that cool Australian summer heat. This is the sort of business that understands what the market truly needs. Like I mentioned above, it already has my respect because of how it projects itself to the market. So we’ve educated ourselves and now I’m ready to try the product out. Before I looked into the brand, it reminded me of those hair products a barber shop would have lined on the shelf. I’m not a huge fan of barber shops previously but currently in my financial crunching, you have to cut out the Aveda salon because you’re working fewer hours than before. But it is only temporary! I miss those salon chairs, the cappuccino’s, talking to my hairstylist about men and why they are all so awful. (Obviously this was way before I met Jacob!) It was always a safe place for me to be myself and not feel any judgement. Not to slate barber shops in general, I’ve been to some great ones whilst on a budget. But back to the point I was making. The first look at the design, just reminded me of barbershop hair products. I decided to do a little step-by-step guide to using this product as to help my readers who are after some advice. Like I’ve mentioned before, I used many different brands and products for my hair over the last 10 years. Everyone’s hair is different. So some products wont work as effectively as others might for your hair. It is no different to your skin. Some moisturisers will be better than others. Now I’m no scientist, but everyone is constructed differently. You skins oils will vary so much to the next person and your hair oils too. You’re built up entirely of these levels of oils and chemical balances/imbalances. You’re the end product of this construction. So it is natural to find products that may or may not work for you. Because of this, I’ve learnt to shy away from heavier hair products. I personally love that natural, no product look to my hair styling. I very much dislike feeling like I’ve coated my hair in the product. Only because I’m forever checking on it throughout the day. I’m constantly running my hands through it so I need a product that is light, holds, doesn’t leave a residue and lasts the day. Once washed, I tend to dry my hair each time. That being said, I’m also human and sometimes I cant be bothered. We’re all entitled to a lazy day babes!! So I usually dry using a hair dryer, because it saves time and you can somewhat steer your hair into a direction. I am unfortunate to have a cow-lick on my left side. What is that… click the link, I swear it is nothing crazy! 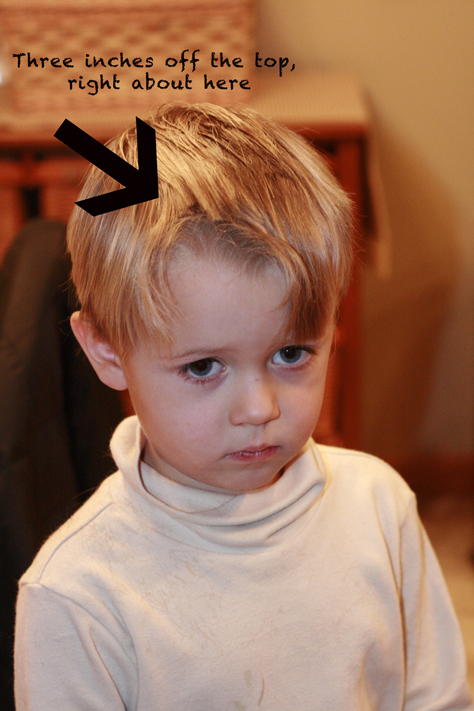 Basically at the front of my hairline, my hair goes off in different directions. So when I was a little kid, it used to look like the picture in the link. Thankfully I can use products now to hide it more! My point about the hairdryer, is that I am able to force the hair in the direction I want it to go into, using a comb and or my fingers. So basically it already gives your hair some volume too. Blowing out your hair into a shape and style before putting the product in, which will hold it for the day afterwards. It is much nicer to style hair too, when it is washed and tame. I put my hands up to my morning hair. I’m glad my boyfriend loves me enough to endure my wild morning hair. (He’s a good man!) So I always have to wash it, so I am able to style is easier and make sure it looks good for him too. So once it is been blown out, I let it cool off for a little bit. Either take the time to check my little Township game on my phone. Collect my taxes, harvest my watermelons and visit my city… By this point my hair is really cool now. I tend to find that when you hair is warm to touch, hair products change a little bit and give a slightly different finish. You will be warming up the product later in your hands, so best to use a cold head of hair when we style later. I’ll explain this further down! Sometimes if I want my hair a little flatter, but in the same style and depending on the type of hair product I use, I might wear a baseball cap after to keep my hair in shape, but softened. This holds the hair down taking out some of the weight. It’s a great little trick to having less volume, but keep that blown out hair appeal. Now specifically for my type of hair and the product, I am going to use a tiny blob. This because, I want to keep a more natural looking finish. This Vitaman hair pomade has a much gummier texture to my usual styling product from Aveda. But I’m happy to try it out and give it my honest opinion. Compared to my usual preferred product I noticed the consistency was much different. Vitaman’s is more tackier to the touch. It almost stretches, once warmed in the palm of your hand and massaged a little. The body of product, deforms allowing you to run it through you hair. That being said because of it’s formula, I would be VERY light with it running it through your hair. It feels a little like glue and because of how fine my hair is, that will strand together and look greasy, if clumped when put on. So I make sure I use a pea size amount and then go back if I want to add a little more. It is a good idea to use the rough amount otherwise you hair will look heavy with product. I made sure I also worked the products in the palm of my hand, to stretch it out and make it go a little further. This will benefit your styling and also wallet and you end up using less and still getting that same styled goal. *Granted my pea size seems massive in these photos! Apologies, maybe giant pea would have been better. Can you even get giant peas? The best ways are to lightly go across the top of your hair to hold it in place and then using clean dried hands you can style it before it sets. Or to work in the tiny amount you’re using into the roots work your way out to the tips. The way you style your hair is up to you entirely. I went in the direction I blew my hair out, I’d already marked how I wanted it to look with the hairdryer and comb, and the product is more really to hold it in place. Now I’m happy with the end result. But I’ve also added in a section about using too much of the product on your hair and it leaving you with a very heavy residue. Below you can see I have covered my hand using a larger size piece and rubbed my hands together. The product is like warm chewing gum and already I can feel it being too much for my fine hair. You’re still able to get a styled look, but it is very noticeable in day light especially. That for me is a strike to my confidence, because I can feel the product sitting on my head. You can see what I mean in this daylight shot. To me, my hair looks greasy and full of the product I used. It is heading more towards that ‘wet-look’ style, which is not what I am after. It reminds of using gel as a teenage and sticking a clump of your hair at the front up and it being nasty and spikey. Not my favourite years to remember! Now overall the product is really good. I learned a lot about this brand whilst doing this review and I’m happy to say, it is a really nice brand overall. However, this specific product is something I would personally shy away from. That being said, it doesn’t mean I will be avoiding this brand entirely. There are some fabulous other pieces from their collection I’d love to try and review in the future. And maybe I will one day! But this hair pomade doesn’t give me that ‘specific’ finish I am after. I am able to use it to style my hair nicely and feel confident, but it is a little too much for me personally. I said above I adore my usual product as it is almost invisible. I do say that this product from Vitaman was good and I mean that honestly. The ingredients used, you can tell are high end and exactly what they preach about as a company! The scent for the product is lovely too, leaves a nice aroma in your hair with hints of citrus. But for me, it is the finish. Maybe if my hair structure was different, maybe dryer or thicker, this product would work for me better. Sadly it doesn’t, but as far as a company, I really love what Vitaman is all about. I really do hope to be able to sample more of their range and see whether I get on better with their skincare selection? Looking forward to that!! Let me know if you’ve ever used this product from Vitaman, or something similar? Have you had better luck? Send me a comment! New reader here, you are adorable!